Born in St. Louis, Missouri, Art was a professional baseball player for thirteen years starting his illustrious career with the Cincinnati Reds in 1960. He was traded to the New York Mets in the winter of 1967 and was a major part of the ‘Miracle Mets’ that won the 1969 World Championship defeating the Baltimore Orioles. During the championship season, Art batted .300 and led the Mets in the National League Playoffs batting .537 vs. the Atlanta Braves with seven hits in thirteen at-bats. The popularity of the 1969 Mets is everlasting and Art maintains, “There isn’t a day that goes by that someone doesn’t want to talk to me about the 1969 Mets.” In addition to being part of that incredible New York Met team, Art also had another distinction to add to his baseball career. In 1966, while a member of the Cincinnati Reds, he tied a Major League record by hitting four consecutive home runs in four at-bats over two games. He is the only player in Major League history to hit three home runs in a game who was not in the starting lineup when the game began. Also, two of the three home runs came in extra innings. The fourth home run was hit as a pinch-hitter in the following game. The bat used to accomplish this speacial feat is currently on display in Baseball’s Hall of Fame in Cooperstown, New York. Since his retirement from baseball, Art has maintained his visibility in New York City working in different endeavors. He has been an entrepreneur in various businesses, including owning a number of restaurants and real estate projects. 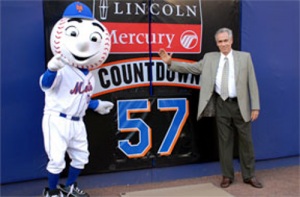 He has also worked as an on-camera sports broadcaster at WNEW-TV Channel 5 in New York City, ESPN Television, and a broadcaster for The New York Mets, doing play-by-play and color commentary on radio and television. In addition, Art hosted a talk show on WFAN Sports Radio and has written featured articles for newspapers and magazines. Art is the author of “The Magnificent Seasons”, a book about the New York Jets, New York Mets, and the New York Knicks, all winning championships, ironically all for the first time in their history, in the period 1969-1970. The book not only follows the exploits of the three teams, but the effect they all had on the people of New York City and the country at a time when so much turmoil affected us all. Assassinations, the war in Vietnam, social unrest, political upheaval and much much more was tearing the country apart. These three underdog teams helped many people put their problems aside for a short period and gave hope to many who were filled with despair. Also, Art has been featured on the cover of Bazaar Magazine, and appeared on the popular television sit-com “Everyone Loves Raymond.” In the series, one of the main characters is an Art Shamsky fan, who names his dog “Shamsky.” In the summer of 2007, Art managed the Modiin Miracle, one of the six teams in the new professional Israel Baseball League, a history making endeavor. In 2012 he was named “Ambassador” for Baseball for the Israel Association of Baseball. In that role he helped Israel’s effort to be part of The World Baseball Classic and also help in the development of baseball/softball in Israel. His web-site www.artshamsky.com features popular collector items and describes his newest venture in Mentoring and Consultation for youngsters. Art continues to make personal appearances and speaking engagements and is currently working on another book to be published in 2019 on the 50th Anniversary of that incredible 1969 New York Met Championship.